James Patterson's bestselling Middle School series is now a major motion picture! 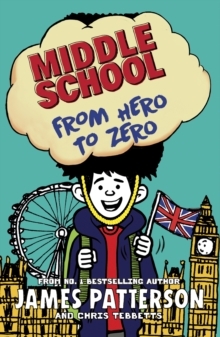 Catch up with everyone's favorite troublemaker, Rafe Khatchadorian, when he gets lost in London on the worst field trip EVER!After a mostly-successful stint at Hills Village Middle School, Rafe is excited to visit the incredible city of London with his class. Sightseeing around a foreign country sounds like a blast, until Rafe finds out his roommate will be none other than Miller the Killer, bully extraordinaire!Then Rafe is forced to work on a class project side by side with his crush Jeanne Galletta and her too-perfect boyfriend, which might be even more torturous than rooming with Miller. And it's no surprise that Rafe's bad luck follows him across the pond, putting him in one crazy situation after another - all under the watchful eye of his bad-tempered principal. Out of all of his adventures, this trip could prove to be Rafe's most embarrassing yet, undoing everything good he has going for him back home!